U.S. Rep. Beto O'Rourke, D-El Paso, left, faces U.S. Sen. Ted Cruz in debate at the KENS 5 Studios in San Antonio on October 16, 2018. SAN ANTONIO — In the lead-up to the U.S. Senate debate here Tuesday night, Democratic candidate Beto O'Rourke heard from supporters who wanted him to take a more aggressive stance toward Republican incumbent Ted Cruz. Over the hourlong event, the El Paso congressman took a series of harsher-than-usual swings at Cruz — including a couple of blows evocative of the senator's battle with Donald Trump in the 2016 presidential race. "He’s dishonest," O'Rourke said of Cruz at one point. "That’s why the president called him Lyin’ Ted and it’s why the nickname stuck because it’s true." "It's clear Congressman O’Rourke’s pollsters have told him to come out on the attack," Cruz shot back. “So if he wants to insult me and call me a liar, that’s fine." Trump fueled a number of contentious exchanges during the debate at the studios of KENS 5, the CBS affiliate in San Antonio. Early on, O'Rourke accused Cruz of not being able to stand up to the president for Texans, while Cruz went on to dismiss the idea O'Rourke would be able to work with the president after expressing support for his impeachment. And "Lyin' Ted" was not the only Trump-style insult aired in the debate, with O'Rourke telling Cruz multiple times that he was "all talk and no action." As O'Rourke hammered Cruz as more interested in his political career than representing Texas — "Ted Cruz is for Ted Cruz," the challenger said at one point — Cruz pressed his long-running case that O'Rourke is captive to the activist left and too liberal for Texas. He also repeatedly cast O'Rourke as a key agitator if Democrats take Congress for the next two years under Trump. "You want to talk about a shutdown?" Cruz said after O'Rourke raised Cruz's leading role in the 2013 government shuttering. "With Congressman O'Rourke leading the way, [there'll be] two years of a partisan circus and a witch hunt on the president." O'Rourke offered a deadpan response, telling Cruz it is "really interesting to hear you talk about a partisan circus after your last six years in the Senate." Cruz and O'Rourke, who first debated Sept. 21 in Dallas, may have sparred for the last time before Election Day when they took the stage in San Antonio. A debate that had been planned for Sept. 30 in Houston was postponed amid the battle over Brett Kavanaugh's confirmation to the U.S. Supreme Court, and it has not yet been rescheduled. After the debate, O'Rourke was set to head to the Rio Grande Valley to participate in a CNN town hall Thursday in McAllen. Cruz declined to appear back-to-back at the event but has since sought to turn it into another debate. The Texas Senate race is one of the closest-watched midterm contests in the country. The Democratic challenger, Beto O’ Rourke, has been skateboarding through Facebook Lives, dueting with Willie Nelson and collecting a record $38 million in the last quarter — more than three times the total of incumbent Republican Ted Cruz. Still, polls show Cruz leading by as many as nine points. Republican incumbent Sen. Ted Cruz and his Democratic challenger, Congressman Beto O'Rourke, will debate tonight one final time before early voting begins Monday. 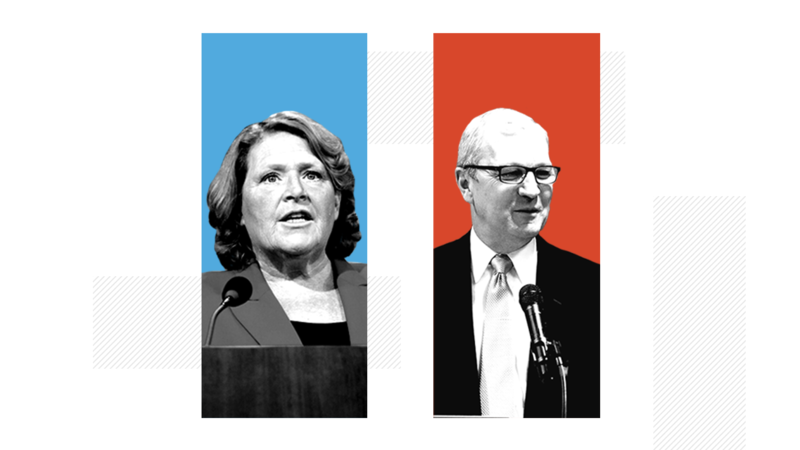 The battle for the Senate is being fought on Republican-friendly turf, and with three weeks until Election Day the GOP is increasingly optimistic that the chamber will remain in the party's grasp. Fears that a fiery Democratic opposition could turn the map upside down have abated some, now that the GOP base is more tuned in following the confirmation fight over Supreme Court Justice Brett Kavanaugh.